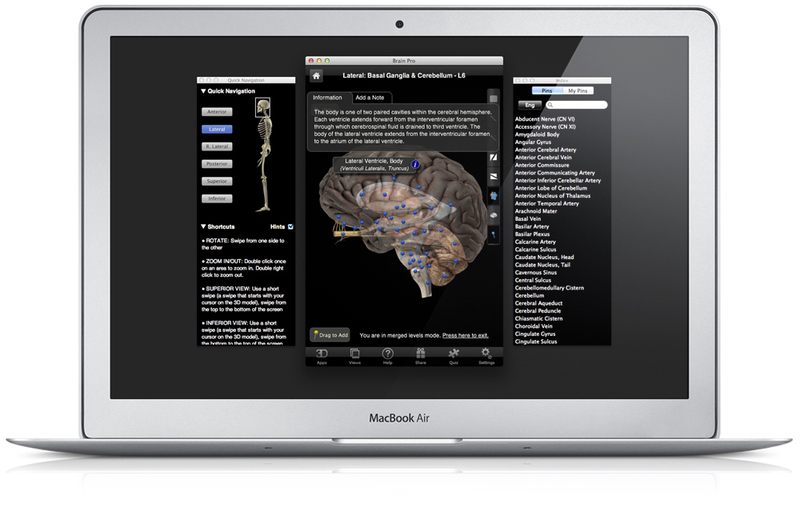 The Brain Pro is a must have app for anyone studying anatomy and is aimed at students with a basic to advanced level of anatomical medical knowledge as well as medical professionals. 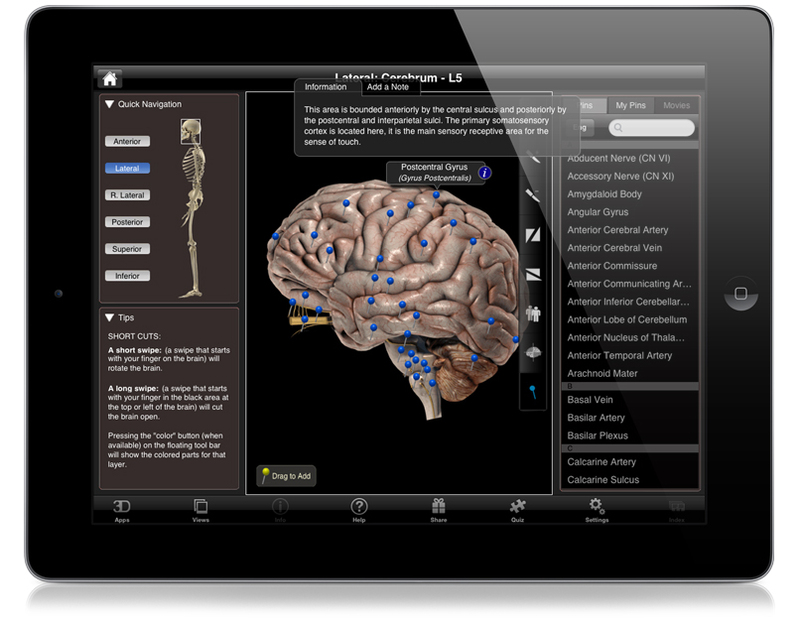 The user can manipulate the Brain on screen, The app also allows sectioned views and the ability to add custom labels. The user can also change the transparency of various elements of the Brain to give phantom views which aid in identifying exact positioning. The brain can be fully rotated with a quick swipe, users can also zoom in and out of the brain. And rather than just the standard anatomical views, you can now observe the location of a brain component from different angles such as inferior and superior views. 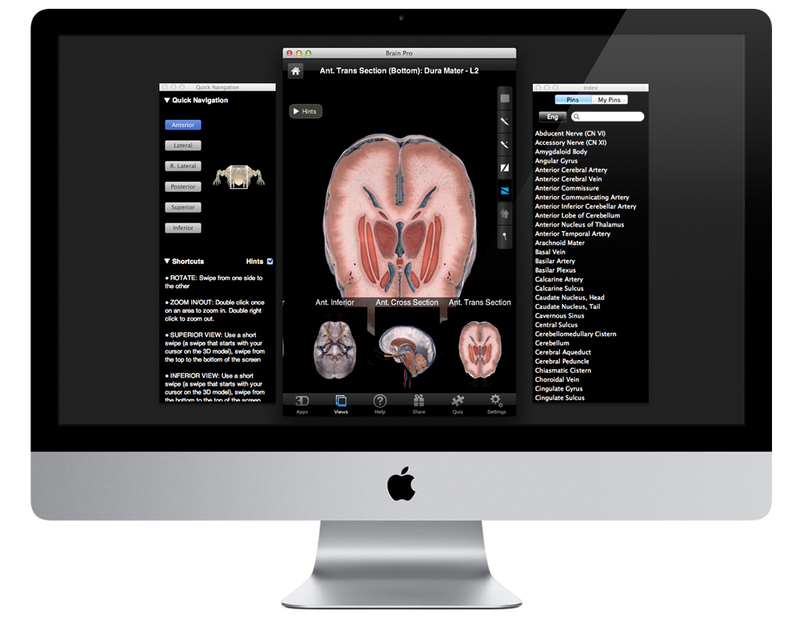 Transverse, Coronal and Sagittal cross sections are also available with full labeling. By pressing the index button the user is offered an index of the pins available. If a pin name is selected the app will take the user to that pin and label it or a user can simply press the pin button on the floating toolbar and it will show all the pins available on the current screen. On selecting the pin the user can view detailed information and add notes as well as create custom pins! The app can be further customized by using the settings button to turn on and off individual pins. This feature is as a direct result of user feedback. The brain model is comprised of eight different layers, from the Dura Mater down to the Thalamus – users can view each individual layer by using the scalpel tool. In addition, by pressing and holding on the transparency icon the user is offered an options window where the opacity of each layer can be controlled. This can offer the user different comparative or phantom views, for example – the position of the Ventricles within the Cerebrum. Colored schematics of the brain are also available on various layers which show the different regions of the brain.